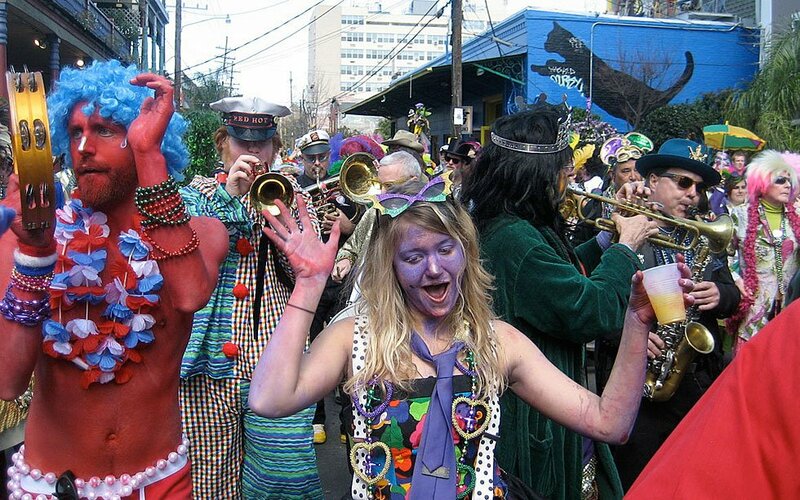 The Mardi Gras festival is about as un-Christian as can be imagined, but it celebrates the day before Lent and so in theory should be as Christian as Lent itself is. You probably know Christians who observe Lent, and maybe you even do yourself. But how much do you (and they) really know about this period of time? First, let’s explain what Lent is and when it is observed. Lent is generally considered the 40 days, starting from Ash Wednesday (ie the day after Shrove Tuesday, aka Mardi Gras) and running through to the day before Good Friday (which is known as “Holy Thursday” or “Maundy Thursday”. Some other sources say that Palm Sunday (or even the day before Palm Sunday) is the last day of Lent. (Palm Sunday is the last Sunday before Easter). The Lenten period of 40 days is supposed to mirror the 40 days that Jesus spent fasting in the wilderness (Matthew 4:1-2). The number 40 appears elsewhere in the Bible too – the Flood lasted 40 days and nights, the Jews spent 40 years in the wilderness, and Moses fasted for 40 days before receiving the Ten Commandments. In 2019, Lent starts on Wednesday 6 March and ends on Thursday 18 April. And that highlights the first interesting thing about Lent. If you go to a calendar, and remember to include both the first and last day in your count, you’ll see that there are actually 44 days between and including Wed 6 March and Thurs 18 April. This is because, in the western church (but not in the Eastern/Orthodox church) Sundays are not counted as part of these 40 days. So, when you take away the six Sundays which aren’t counted from the total 44 days, you get – ooops. 38 days. And if you stop on Palm Sunday, or the day before Palm Sunday (sort of the same thing for counting purposes because remember Sundays aren’t counted) then you’re back down to 35 days. We think. So Lent is actually a not-40 day period, no matter how you choose to count the days. Hmmmm. The name “Lent” is believed to derive from the old English word meaning “lengthen”, which reflects the start of spring and when the days begin to get longer (although to be exact, the days start getting longer right from the winter solstice, the key trigger point of spring is either the vernal equinox on about 20 March or simply the start of March). Due to the varying interpretations of Lent, perhaps the BBC can be considered a neutral and careful source for explaining/defining what Lent is. Another interesting thing about Lent is that it is one of the few Christian festivals/events/celebrations that haven’t been secularized. We all know and cringe at how the Christmas period has become “the Holiday Season”, and how Easter is now taken over by bunnies and eggs. But, strangely, the concept of giving up some of life’s pleasures, for 40 days, has yet to find much popular public support! Or did we speak too quickly. What about the last pre-Lent day, Mardi Gras, which seems to celebrate many very non-Christian vices, even though Mardi Gras would have no meaning or significance if it weren’t for the onset of Lent the next day. So, How Long is Lent? Right away, you can see a bit of a problem. The 40 days don’t actually add up to 40 days. Depending on when Lent starts and stops (itself an ambiguity), and whether you include Sundays or not, it seems Lent is either longer or shorter than 40 days, but never is it exactly 40 days in the western/Christian calendar as used by the churches that advocate a Lent event. Doesn’t that sound a bit strange? A 40 day religious festival, climaxing in the holiest event in the Christian calendar – Christ’s death and resurrection – that isn’t actually 40 days. That’s a bit like saying that Easter, carefully defined as being three days and three nights, isn’t actually three days and three nights (let’s see, now – from Good Friday to Saturday is one day/night, and from Saturday to Easter Sunday is a second day/night, and – wait – where is the third day and night?). Contrast this with Matthew 12:39-40 where Jesus said that the only sign he was the true Messiah would be his spending three days and three nights in the heart of the earth. Okay, that’s a different topic entirely. One we’ll revisit closer to Easter itself. Let’s stay focused on Lent for now. Why is Lent not the 40 days it says it is? Perhaps now it is time to turn to the Bible and see what it actually tells us about Lent. But first, let’s understand exactly what Lent is, or at least, how people traditionally observe it, so we can compare that to the Bible authority as well. The concept of Lent is it should be a time of quiet fasting and thoughtful reflection. And there’s another problem. What exactly is fasting? The word’s simple meaning suggests not eating anything. The Bible refers to fasting in several different forms, ranging from simply abstaining from any one thing or things (1 Corinthians 7:5) through to avoiding certain foods or all food (Daniel 1:8-14 and Daniel 10:2-3 in the Old Testament) to neither eating nor drinking at all (Luke 4:2 and Acts 9:9) but none of these references are requirements or even recommendations that Christians should do the same in normal circumstances or at Lent. We’re unaware of churches ever requiring the Lent observance being in the form of a complete rigorous fast – if anything, quite the opposite. We saw a rule from centuries back suggesting that you should only eat one full meal and two light meals each day for a “fast” during Lent, but that’s about all many/most of us eat on a normal day, anyway. Nothing much special with that requirement. These days, the rules on fasting are even less rigorous than that mild requirement. Traditionally, a “way around” the concept of not eating any food was to not eat any of some types of food – a similar sounding and worded concept, but a very different actuality. This likely would include avoiding meat, fish, fats, eggs and milky foods. Some traditions suggest simply “giving up a favorite food” for Lent. Or not even a food item, maybe a “thing” instead. Some people try not to swear, or even maybe attempt to give up smoking, or stop watching television. Other traditions suggest that instead (or as well) you should do something extra to affirm your Christianity. Say another prayer, read more of the Bible, go to church more regularly. None of these doing extra things are bad, indeed, we’d suggest in this context that Lent should not be kinda sorta 40 days long, but it should be all year long. If you can be more worshipful for 40 days, that does beg the question – what about the rest of the year, too – doesn’t it. This raises a concern – is Lent in effect telling people “You only have to strive to be a good Christian for 40 days of the year, the other 325, you can take it easy”? Definitely, it is time to see what the Bible tells us. How long is Lent, and what exactly should we do or not do during this period, compared to the rest of the year? Well, this is tricky. It is hard to prove a negative, and maybe we’ve missed a passage somewhere, but as best we and other commentators can see, nowhere in the Bible is the concept of Lent mentioned. Indeed, the churches that advocate the observance of Lent don’t even claim this is based on Biblical reasons! It is true that the Old Testament is filled with religious festivals and events and procedures. Fasting wasn’t prominent though, there was only one day of every year – the Day of Atonement – when fasting was required. But the New Testament and Christ’s sacrifice on our behalf absolved us of the need to follow all such things. It reduced the previously required one day of fasting down to zero, not up to forty. Our article “Is the Bible Permissive or Restrictive” approaches this concept in general terms, and explains that our salvation is through our faith and God’s grace, not through “good works” as was the case prior to Jesus. Please don’t get us wrong. We’re not saying that observing Lent is necessarily bad. You can never be “too Christian” (although see also our article “Do Some Churches Make it Too Hard to be a Christian” for a cautionary note on this point). But our salvation is neither made more certain if we do observe Lent, nor less certain if we don’t observe it. It is true that the Bible occasionally speaks approvingly of fasting, and the underlying event supposedly underpinning Lent was Jesus fasting for 40 days in the wilderness. But there’s an ocean of difference between fasting, especially in the sense of enduring substantial hardship and not eating anything at all, and simply giving up a comfort food and compensating by eating more of something else instead. 16 “And whenever you are fasting, do not look gloomy like the hypocrites, for they put on a sad and dismal face [like actors, discoloring their faces with ashes or dirt] so that their fasting may be seen by men. I assure you and most solemnly say to you, they [already] have their reward in full. 18 so that your fasting will not be noticed by people, but by your Father who is in secret; and your Father who sees [what is done] in secret will reward you. Isn’t that almost exactly the opposite of publicly showing (boasting?) of one’s Lenten observation? A similar negative view of fasting is mentioned in the Parable of the Pharisee and the Tax Collector (Luke 18:9-14). Fasting alone does not endear you to God, and proud public fasting is especially unpersuasive. Private personal fasting as part of a focus and concentration of mind on a special communication with God or need/prayer of request is approved of, but ritualistic public fasting is clearly not desirable. Jesus was directly asked why his followers did not fast (Matthew 9:14) which further suggests that he was not requiring his followers to fast. (His oblique answer was that there was no cause for unhappiness for Christians, and that old traditions didn’t fit well with his new message, see Matthew 9:15-17). We feel the reality of Lent is hinted at by the fact that churches can’t even get their basic story straight about 40 days. It is another example of a pagan tradition being slightly changed and then clumsily brought into the church. Is it a coincidence that Lent begins at close to the equinox and the traditional start of spring? Even its name is derived from non-Christian concepts, and this article claims the celebration derives from the worship of the Roman god, Mithras, a practice that started in the first century and ended pretty much as Christianity became the official Roman religion. But if a non-Christian foundation can be turned and used to our advantage, where is the harm in that? Isn’t it sort of the opposite of “the Devil quoting scripture for his own sake”? Maybe that is a justification, but in that case, we need to be honest with ourselves as to what Lent is and why it is observed, rather than pretend it to be a pre-existing element of Christianity. So Why Do Some Churches Advocate Lent? There are perhaps two reasons why churches encourage their members to observe Lent. The positive reason is to use the pre-Easter period as a means to try and “super-charge” people’s faith, to use this special period as a time to reaffirm one’s relationship with God and Jesus and draw closer to them. There’s nothing wrong with that, and it is sort of loosely echoed by the concept of the Advent period prior to Christmas, too. We’re torn as to the good sense of encouraging people to be “super-Christian” for two short periods of each year. Does that mean for the other almost ten months, people can be less Christian? Sure, it is important for people to “find their own level” and to set a sustainable level of ongoing commitment, but isn’t the flip-side of Lent (as mirrored, perhaps, in the bacchanalian excesses of Mardi Gras) the concept of being less “burdened” by Christian standards for the rest of the year? If something is appropriate (or inappropriate) at any time of year, shouldn’t it be similarly viewed for the entire year? Christianity is a 24/7/365 way of life, not a seasonal or occasional thing. So we understand the positive effect of giving people’s faith a sudden “boost” at these times of year, but it seems unfortunate that such boosts end as suddenly as they start. Now for the second reason, and this is a more cynical one. We fear and wonder if, many centuries ago, the authoritarian structures of the churches used such things as a form of control, and also as a form of separation between the ordained church leaders and the unordained church members. Because, it isn’t just Lent and Easter and Advent and Christmas. There are festivals and events pretty much running through the entire year, to say nothing of such things as Saint’s Days that can conveniently be counted on to make any remaining days also “special” (see, for example, this listing of some but not all Catholic Church events and another list here of Episcopal events). This makes the concept of practicing Christianity into a complicated process of ritual, with a requirement for ritual leaders, and an ability for one’s participation to be observed and judged by the church leaders. It helped the leaders to affirm their position – they weren’t merely church elders – ie wise respected good Christians – they were instead possessed of “special knowledge” that the lay people couldn’t hope to similarly acquire and obtain, other than by similarly devoting their entire lives to the study of how the early churches required Christianity to be observed. Being a “good Christian”, way back then, wasn’t so much a quiet and personal thing, it was a very public thing, and if you didn’t get it right, you’d be censured and perhaps fined for your poor compliance and required to pay a penalty in order to have your promise of salvation returned to you. This utterly unChristian concept – the selling of what were called “indulgences” was the catalyst that caused Martin Luther to write his 95 Theses and start the Reformation. So, whether as a reason/justification to encourage people to get closer to their faith, or for less positive reasons of surrounding Christianity’s simple message of redemption through grace with many layers of unnecessary man-made artifice, early churches created a “tradition” of Lent from nothing. So, Is it Bad to Observe Lent? We have to be very careful how we answer this. Because, no, it absolutely is not bad to put your Christianity into overdrive, at any time, for any reason. Being a Christian should be a joyous and voluntary lifestyle that you do because you want to, not because some minister or priest in some church tells you that you must. We’d suggest you use Lent as a bit like a “spring cleaning” – a chance to re-evaluate how you observe and practice your faith for the entire year, and perhaps try to improve a bad habit or weakness, and strengthen some element of how you enjoy your faith, not just for 40 days, but for as far into the future as you can. But don’t use Lent as a way of conspicuously signaling your virtue and “good Christianity” to others. Don’t do it to have something to boast about. And, although we said before that Lent has not become a popular secular event, we have seen people who are not at all Christian, but choosing to observe Lent in some form as a personal challenge, completely devoid of any Christian meaning. Most of all, don’t expect special favors from God in return. Here’s an interesting article that starts off in a form quite unlike what one would expect from an author who is also a Pastor, but see how it evolves and you’ll get past the anecdotes to some solid Christian principles. Lastly, we note, and perhaps wisely without comment, this man’s distinctive approach to celebrating Lent, although he claims to be inspired by monks in the 1600s.